Cristina Fernández de Kirchner wanted to change Argentina’s constitution and run for a third term. Her government is now so disliked that she can’t consider a constitutional change and, as of today, would be unlikely to win a third term. So the presidential election has started for a first round vote in October this year. Ms. Fernández has a 25 percent approval and most people (70%) believe that a state prosecutor, who was about to indict her and members of her government for obstructing an investigation, died from a suicide or assassination. A criminal indictment filed by a new prosecutor was dismissed by an Argentinian judge. 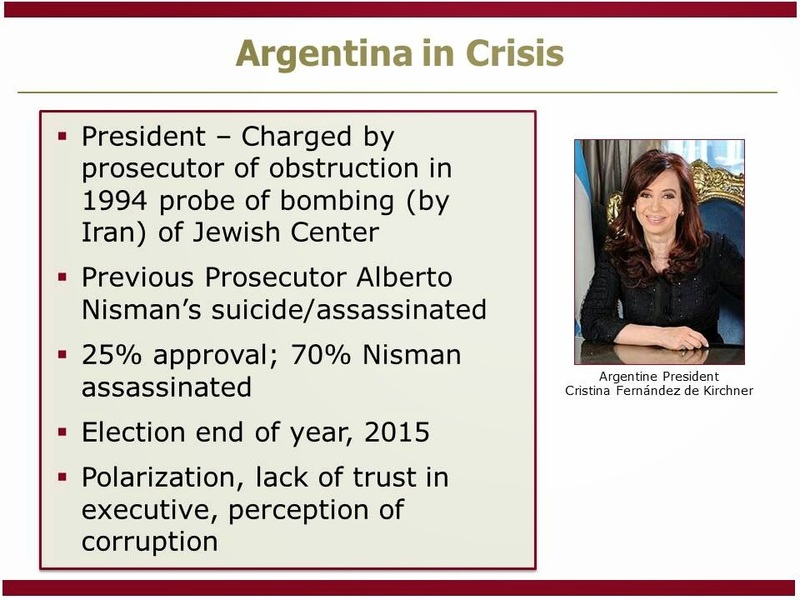 She denies any involvement in the obstruction or death of the prosecutor, but the latest incident, along with a struggling commodities-dominated economy, has left her and her Peronist Party in trouble. Public opinion in Latin America is regularly measured in the Americas Barometer. The latest edition shows increased polarization. A fifth of Argentinians rate President Fernández de Kirchner either “very good” or “very bad,” up from six percent in 2008. 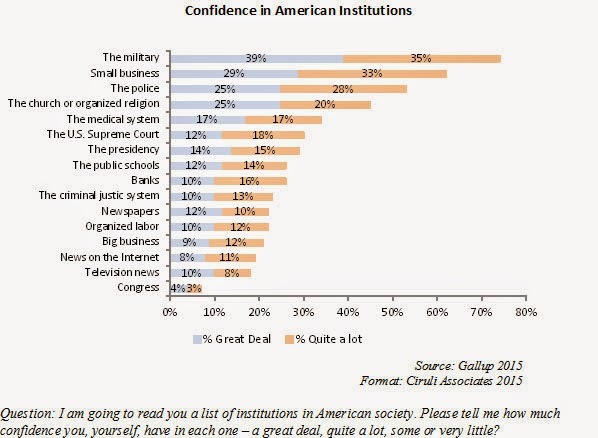 Trust in governing institutions. Argentina tends to be among the low end of countries in terms of public trust in the executive (president) – 42%. The U.S. is also low (39%) and Venezuela is at the bottom of the list (36%). Corruption. Argentina is ranked third from the top in public perception of corruption among Latin American countries. Venezuela is at the top. President Obama’s overall 2014 approval was lower than 2013 by 4 point, 46% to 42%. 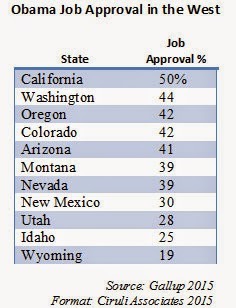 In the West, Obama’s approval was highest in California (5th highest nationally) at 50%, and dead last in Wyoming at 19%, both nationally and in the West. Colorado came in as the 23rd most approving state, right at the President’s national average of 42%. Democrats have a slight 4-point national advantage over Republicans in 2014. But 43% of Americans identify as independents, dramatically up since 2008 (35%). Democratic identities have shrunk the most in the last 6 years from 36% in 2008 to 30% today. Republican partisan identifiers are down from 28% to 26%. When the public is pushed to identify which party they lean toward, Democrats win 45% to 42% over Republicans (in other words, only 13% of Americans truly don’t favor one party over the other). The rise of independents reflects both disenchantment with the performance of government and the growth of Millennial new voters, who tend to identify as independents, but in the Obama era, voted Democratic. The country has been moving to the left on the liberal to conservative self-identification scale since Bill Clinton was elected in 1992. During those 22 years, liberals have gone from 17% of the population to 24%, an increase of 7 points, about 2 points in each presidency (Clint, Bush, Obama). However, conservatism still has 14 percentage points more adherents than liberal identifiers and has increased 2 points since 1992. The percentage of Democrats claiming to be liberal has increased from 29% in 2000 to 44% in 2014. There has been little or no change in self-identified independents or conservatives calling themselves liberal. About 70% of Republicans have been calling themselves conservative since Obama’s election in 2008, an increase from 62% in 2000. Conservatives were a quarter of the Democratic Party in 2000 and are now only 19%. 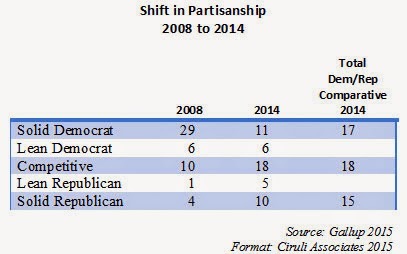 Independents have become somewhat more conservative, up from 29% in 2000 to 33% in 2014. The major increase took place after Obama’s election in 2009. 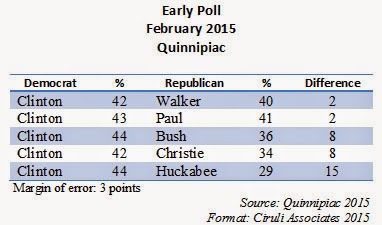 The latest Quinnipiac poll (February 2015) shows Hillary Clinton ahead of the Republican field, but among two candidates, Governor Scott Walker and Senator Rand Paul, her lead is within the margin of error. Both Walker and Paul, who poll well nationally in the crowded field, tend to span some of the divisions in the party. Walker appeals to establishment Republicans as a no-nonsense governor, evangelists due to his Baptist background, and Tea Party adherents with his gutsy anti-government union and cut spending Wisconsin record. Paul’s attraction is more eclectic, but he has base of support among younger Republicans, libertarians and more liberal groups (both small). But he appears to attract more independent-type voters than many of his Republican colleagues. Notice Clinton’s share of the vote doesn’t exceed 44 percent, leaving two to six points to be fought over (Hickenlooper received 49%, Udall 46% both in 2014; Obama in 2008 received 54% and 51% in 2012). 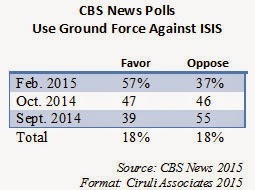 Three new polls show the public has shifted to support for some level of direct military intervention against ISIS. The most recent poll from CBS News (Feb. 13-17, 2015) shows a majority of the public (57%), including Democrats (50%) and independents (53%), want U.S. troops on the ground to fight ISIS. It reflects an increase of 18 percentage points since September 2014. Other recent polls show there is varying levels of support for concern about ground forces. Question wording affects results and, not surprising given recent experience, a majority of the public worry that it will lead to another long ground war. 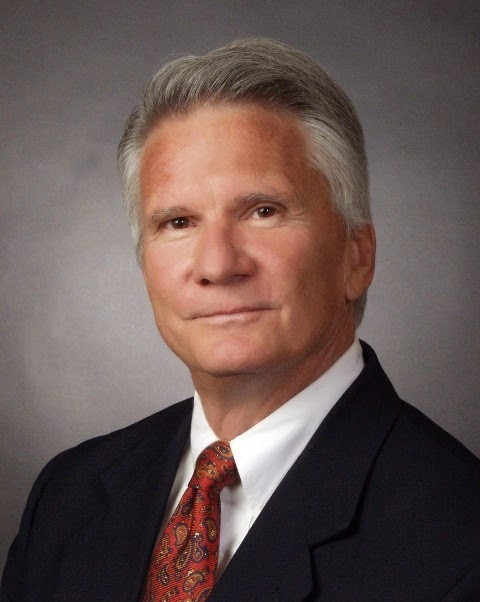 The Denver Post published a guest column on water planning, February 21, 2015. Given the expected changes in the natural environment, the projected growth in residents and competition for water from downstream states, it is in the state’s interest to continue our collaborative planning process and arrive at workable solutions. Colorado’s statewide water planning is overdue. California and Texas, the nation’s two largest states and users of Colorado headwaters, have moved well ahead of the state in planning and investment. Both downstream states are facing major shortages. Texas voters, using a rainy day fund, approved a $2 billion bond with 20 percent reserved for conservation, 10 percent for rural areas and the remaining funds for investments in reservoirs, recycling aquifer recharge and other supply infrastructure. California, which experienced gridlock for more than a decade among its perennial competitors--farmers, environmentalists and municipalities--and a horrendous divide between north and south water users, managed to craft a $7 billion conservation and infrastructure bond initiative that passed last November by 65 percent with help from serious drought and a very popular Governor Brown. Colorado, after more than a decade of discussions river basin by river basin, has finally produced a draft plan, making 2015 potentially the year for making progress on water. But the state faces forces similar to California’s contentious factions. A continuing division exists among east and west slopes, environmentalists who argue for conservation measures to the exclusion of most other options, and basin parochialists who want to protect only their water and support strategies that send it out of state rather than storing and reusing it. One of the most useful aspects of Colorado’s planning effort has been conducting two scientific studies of the state’s water needs and supply. The first took place during Governor Bill Owens’ administration (2004) and the second was completed near the end of the Governor Bill Ridder’s term (2010). Both studies confirmed a water supply gap up to 600,000 acre-feet by 2050, and that figure assumes a host of projects and programs will be in place within the next few decades--including conservation, storage and reuse. Colorado voters were generally not supportive of extreme views. When asked if conservation alone would be sufficient to make up the water supply shortage, they strongly disagreed and said it would have to be accompanied by storage. And, nearly 90 percent of voters want Colorado to claim its legal share of water rather than allow it to flow out of state, rejecting the view that any one basin has sole control of its supply and can chose to send it to Nebraska, California or Texas before allowing full use by Coloradans. The identified water gap will require decisive action by the Governor and Colorado’s political leaders. After a decade of study and talk, time is running out. Taking measures to ensure Colorado maintains its strong economy and quality of life can no longer wait, and our downstream competitors have already made their moves. Prediction: Republicans will not take the issue of funding the Homeland Security Agency to the brink of shutdown. They campaigned to end gridlock, not cause it. They control Congress and will be blamed for the shutdown, not the President. Any incident characterized as terror and they will be vulnerable. Would Republicans do this to the army? Homeland Security is our domestic army. The Obama administration is at risk of losing control of its foreign policy. In three critical areas – Iran, ISIS and Ukraine – the next thirty days will decide if the administration’s approach of restraint and diplomacy will be sustained or if critics, who generally are advancing more aggressive strategies, dominate. Iran. Negotiation with Iran concerning their nuclear program is scheduled to reach a deadline on March 31 (formal date July 1, 2015) on political issues. After two extensions, it is unlikely there can be another. In fact, President Obama said at this recent press conference with German Chancellor Angela Merkel that time is up and Iran must show it’s ready to make a decision. Opponents of the negotiations are active, vocal and have bipartisan membership. The highly controversial Prime Minister Benjamin Netanyahu’s speech on March 3 to a joint session of Congress is part of the opponents’ strategy. In general, they don’t trust either Iran or the administration to either dismantle the Iranian program for the most conservative pro-Israeli interests to even sufficiently restrain it for moderates. Ukraine. The fragile Minsk (2-12-15) cease fire and Russia’s continued supplying Ukraine separatists has created a direct challenge to the Obama administration’s policy of diplomacy and sanctions. The pressure for a more aggressive policy (weapons for Kiev government) from Democratic and Republican foreign policy leaders will be empowered if the current policy collapses as appears likely. Europe and especially the great powers of Germany, France and Great Britain appear unwilling to be more assertive vis-à-vis Russia. ISIS. President Obama’s resolution for limited war-making power against the Islamic State is now being debated by a very polarized Congress. The effectiveness of the current strategy against ISIS is a factor in a debate that sees Democrats arguing the scope of authorization is excessive and Republicans somewhat contradictory arguing for more authority given their disdain for the administration’s competence. Although the President argues the resolution is mostly for a show of unity and resolve and that he already has sufficient authority, a loss will be interpreted, both here and abroad, as a rejection of the administration’s strategy. It would be another blow to its already embattled foreign policy and low level of credibility. Gallup’s newly released assessment of partisanship in the states shows Colorado 23rd when ranked in percentage of Democrats. There has been a sharp rise in competitive states of which Colorado is near the center in terms of balance between Democrat and Republican. Gallup lists 18 competitive states where neither party has an advantage of five points or more. The only states closer in partisanship than Colorado are Nevada, Louisiana and Ohio. In terms of its western neighbors, Colorado’s partisan position highlights its competitive image. 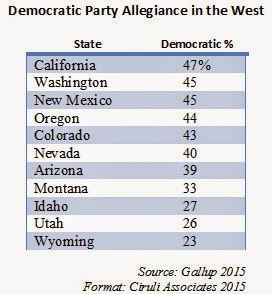 California is the most Democratic (47%) western state, followed closely by Washington (45%), New Mexico (45%) and then Oregon (44%). Colorado (43%) makes it 23rd in the country and just off the center of the West. Dead center is Nevada (40%) and nearby Arizona (39%). Further down the list in terms of self-identified Democrats are Arizona (39%) and Montana (33%). The West holds the three lowest spots in the country for percentage of Democrats: Idaho (27%), Utah (26%) and Wyoming (23%). Although the percentage of Louisiana Democrats and Republicans is near equal, the state is the third most conservative in the country. Colorado, which is near the center of the states in terms of partisanship (23rd), is 15th most liberal on a liberal to moderate to conservative scale of self-identification. However, conservatives still exceeds liberals in the state 34 percent to 25 percent (9 points). The state has more voters claiming to be moderate than conservative (34% conservative to 37% moderate). Among western states, citizens in Utah (45%), Montana (43%) and Idaho (43%) identify as the most conservative. 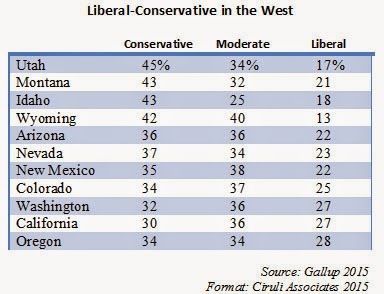 Whereas the West Coast states of Oregon (28%), California (28%) and Washington (27%) are the most liberal. 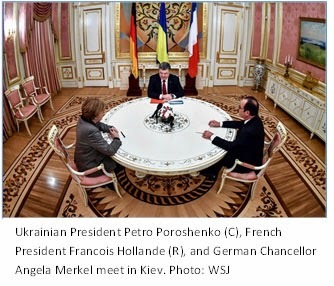 Although the Minsk agreement has frozen EU and U.S. policy toward Ukraine, while the fragile cease fire agreement is implemented, it is clear from the last week of hurried meetings in Munich, Minsk and Washington, President Obama’s and Prime Minister Merkel’s diplomacy and sanction policy is in trouble, at least among Washington policymakers. Of course, a division among the Western alliance is a goal of President Putin, but the likely outcome may be less to his liking. More severe banking and finance sanctions, some aimed at additional members of his wealthy inner circle, are in the offering. More important, a serious examination has begun of a military defense strategy for Kiev and the western parts of Ukraine that’s not under separatists and Russian control. 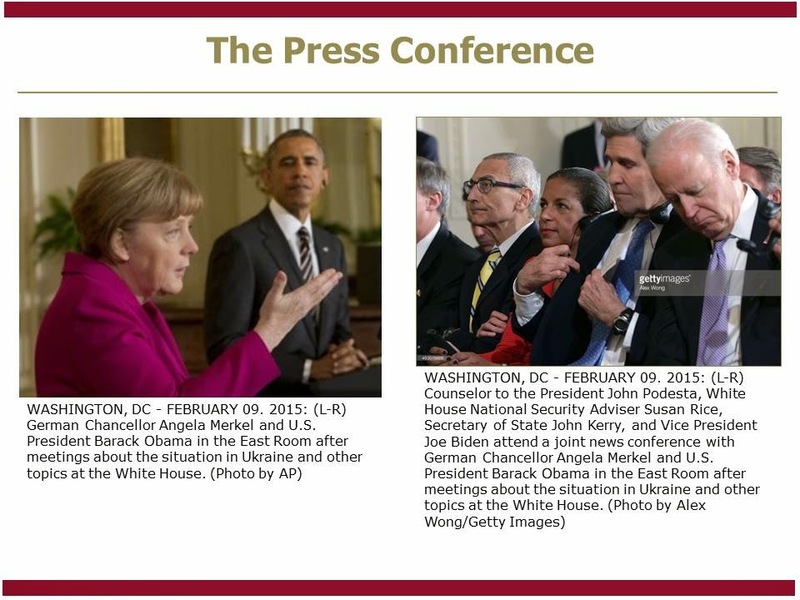 The importance of the Merkel-Obama press conference (2-9-15) was reinforced by the presence of the entire U.S. foreign policy team: Vice President Biden, Secretary Kerry, Security Council Rice and Counselor Podesta (Carter, the new defense secretary, had only been confirmed not sworn in). Biden and Kerry both reflect the new harder line toward Russia. 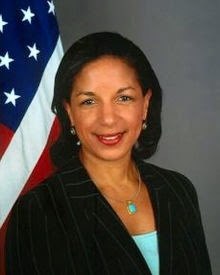 And Rice has been ordered to begin examining military options. Evidence of the policy shift is overwhelming, and even the President, who is still resisting the change in Ukraine, has stepped up with a consideration of a military equipment option if this latest cease fire agreement collapses. Two new polls show Americans support President Obama’s proposed authorization sent to Congress to use force against the Islamic State (ISIS). The level of support depends on the question wording. When a NBC News/Marist poll asked a lengthy question describing the authorization in detail, only about 54 percent of the public supports it. Whereas a CNN/ORC poll asked more generically if Congress should give Obama authority to fight ISIS and 78 percent said Congress should. 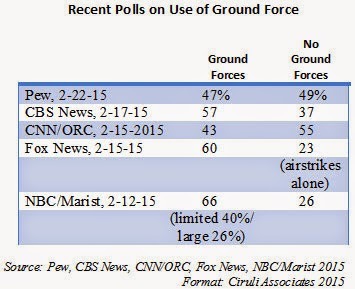 In the CNN/ORC poll, support for deploying ground forces increased from 43 percent in November to 47 percent today. Half of Americans still oppose it. Have the Anti-Frackers Made a Fatal Error? The anti-frackers believe they have a brilliant political strategy – use Denver’s city election as a vehicle to revive their mostly moribund movement. The reaction from Denver’s civic, political and media establishments has been swift. As the Denver Post put it, these mostly out-of-state (and Boulder based) groups want to ban fracking, of which there’s none in Denver, except at the airport. And that produces $7 million for the City of Denver’ revenue. The anti-frackers were tossed off the ballot last fall and have been trying to find a new platform for their anti-hydrocarbon campaign. Governor Hickenlooper’s task force is insufficient for their ambitions. They assume that the Denver City election is an easy channel for publicity, motivation and fundraising. But, the Denver mayor and the councilman from the airport area with the only fracking offered no support. And the business community has stayed organized from last fall’s campaign and is ready to fight. If the anti-frackers lose in Denver, their credibility takes another blow and they will reinforce the perception that they are not a serious political force in Colorado. celebrity-induced delusion? The debate will continue, but Brian Williams will not be back. 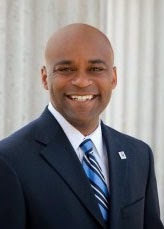 Williams was at the top of his game, and he was at the top of the flagship network news program as the face of NBC. Pew Research just reported NBC was the biggest source of news in the U.S. – averaged 8.5 million viewers per night in 2013 (Fox, News Primetime is about 2 million). Not only did he seriously damage NBC News’ reputation and all its affiliates, such as Channel 9 KUSA locally, but he contributes to the low esteem mass media is held in general in the country. Frank Newport, the editor-in-chief of Gallup, just released a special report on trust in mass media. It interpolates from their regular ranking of American institutions. Television news is at the bottom at 18 percent. It just beats out Congress. Television news dropped in half, from 36 percent in 2000 to 18 percent today in public confidence. Mass media in general (i.e., newspapers, TV and radio) has declined about 15 points since 2000, from 55 percent of a “great deal” or “quite a lot” of trust to 40 percent today. Although Colorado Senate Republicans will not likely reverse the Democrats’ 2013 gun control measures, by raising the issue they are communicating to their base their commitment to protecting gun rights. And the good news for Republicans is that gun rights as a value proposition is in ascendance with the public. Hence, the issue, even with little legislative success, helps Republicans. It also may serve to reinforce Democrats’ vulnerability with middle class voters, both blue and white collar, and especially men. 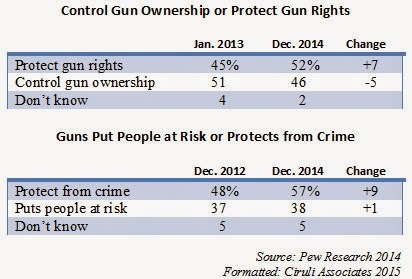 Pew Research asked a question on the basic alternatives concerning gun control and gun rights. Protecting gun rights has increased in public support by seven points in the last two years from January 2013 to December 2014, or from approximately a month after the Sandy Hook shooting in Connecticut to the end of 2014. In Colorado, that includes the 2013 legislative session that approved several gun control laws. In a second question probing people’s views concerning guns offering protection from “being a crime victim” or guns putting “people’s safety at risk,” guns as a protection from crime increased nine points in two years from December 2012 to December 2014. Colorado’s gun control laws may stay, but it’s a problem issue for Democrats, especially from rural and suburban legislative districts. The administration’s position is that nothing can be done without the assent of Germany and France, which for now will not happen. Chancellor Angela Merkel and Ursula von der Leyen, German Defense Minister, both strongly believe there is “no military solution.” And the White House continues to resist any serious consideration of providing weapons to the Kiev government, saying that it would give Russia an excuse to escalate the conflict. Of course, Russia doesn’t need an excuse. It simply escalates the conflict whenever it wants to change the facts on the ground. The reason Democrats, including Hillary Clinton, are putting distance between themselves and the White House is that President Obama has lost the confidence of the American people on foreign policy. 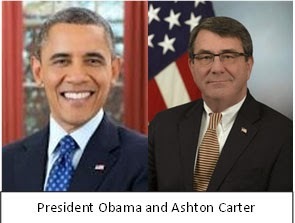 President Obama and the White House, recognizing growing dissatisfaction with their foreign policy leadership, have been strengthening their rhetoric. The appearance of a national security strategy was largely defensive because many observers believe the Obama administration doesn’t have one. A couple of metrics reinforce the Democrats’ concern. 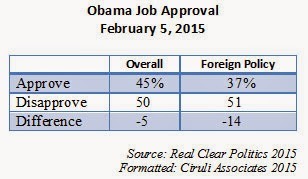 Obama’s foreign policy approval is five or more points lower than his overall approval. It clearly has become part of the arsenal of attacks from Vladimir Putin as he resists what he considers the offensive interference in Russian affairs from the West and he attempts to assemble the world’s traditionalists in a counterattack. 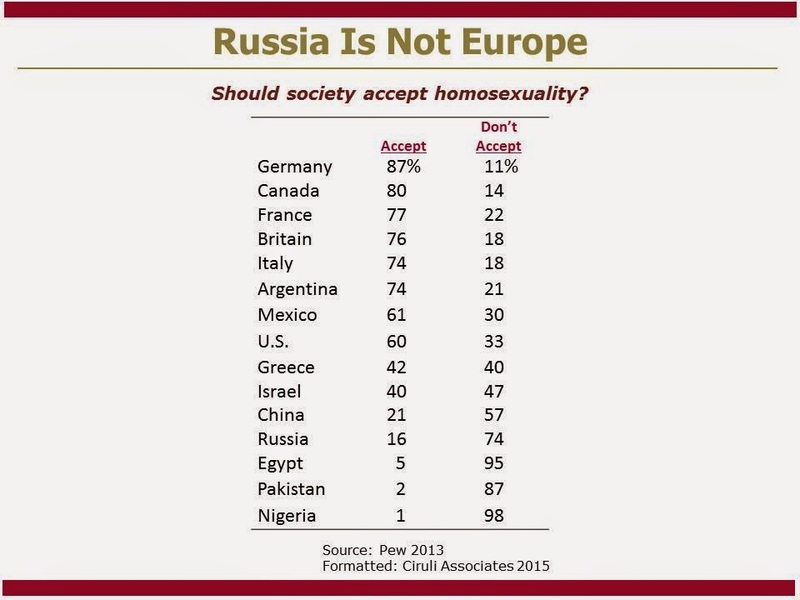 Americans are not as accepting of gay rights as many countries in Western Europe, but there is a significant international divide of acceptance of homosexuality and much of the Middle East, Asia and the Far East are on Russia’s side of low acceptance. There are also differences between men and women and younger and older citizens worldwide. The two largest age groups in America have similar positions on the morality of abortion, but different views on its legality. The Millennials (18-34) and Baby Boomers (51-69) are similarly divided on the morality of abortion reflecting the 57 percent of the public that believe abortion is morally wrong. Fifty-four percent of Millennials and 60 percent of Baby Boomers and older Americans believe abortion is wrong. But Millennials are much more likely (70%) to believe abortion should be legal in all or most cases than Baby Boomers (56%). A majority of the main age categories believe abortion is immoral, but majority also believe it should be legal in all or most cases. At most, only 13% of Americans believe abortion should be illegal in all cases. Nearly twice as many (23%) believe it should be legal in all cases. A majority of the public (57%) believes abortion can be limited in some cases (i.e., legal in most – 33% or illegal in most cases – 24%), which is where much of the debate and political conflict has been located. The marketing division of Omnicom Group claims Brian Williams’ trustworthiness has dropped from 23rd to 835 on its celebrity index. And, he is still receiving huge social media traffic. 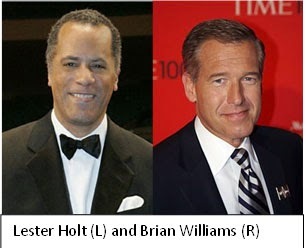 Lester Holt, his Monday night replacement, drew a smaller audience than ABC, another indicator that Williams’ return is in doubt. The sports and entertainment promotional firm, called Marketing Arm, represents Lindsey Vonn and Tim Tebow. This is the year that Baby Boomers and Millennials reach parity in their respective shares of the American population (75 million each). The 2016 election will see the massive Baby Boom Generation eclipsed in size by voters under 35 years old. Since 1968, when the oldest Baby Boomers became of voting age (26th Amendment lowered voter age from 21 to 18 in 1971), they have had a profound impact on the politics of the country, finally reaching the White House with Bill Clinton in 1992 for the Democrats and George W. Bush in 2000 for the Republicans. 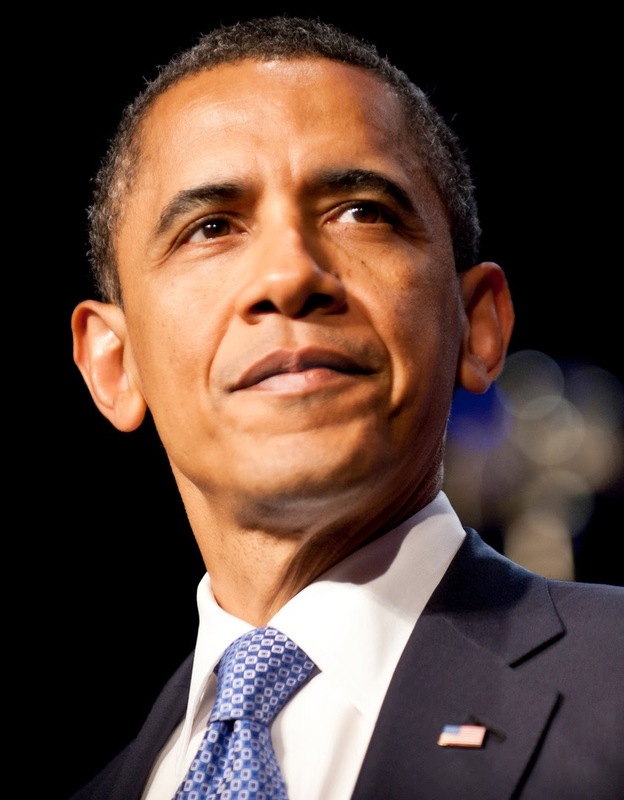 Barack Obama is a youngish member. A major political difference in Millennials joining the voter role is they are much more liberal than Baby Boomers (51 to 69 years old) or even Generation X (35 to 50 years old). Millennials self-report and register more as independent, but they are more liberal, and at least in 2008 and 2012, voted much more Democratic. Baby Boomers were nearly two-to-one more conservative than liberal, but Millennials, according to Pew Research, are more liberal than conservative by 2 points (30% liberal to 28% conservative). As a fan of NBC News and having been interviewed in 2012 by Tom Brokaw, the Brian Williams controversy is painful to watch. Channel 9, the region’s top news station, is an NBC affiliate and all local news tends to be tied to the credibility of the national brand. The fate of Williams is of local interest and impact. But today’s anti-establishment values, online opposition research techniques and 24-7 social media makes managing or surviving an attack on credibility very difficult. 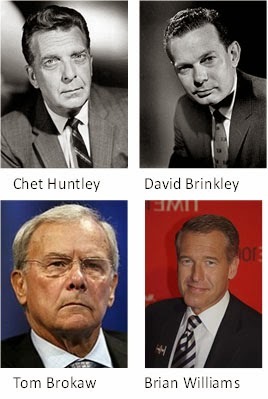 And, as opposed to entertainers or most politicians, credibility is Brian Williams’ main asset. The seven-county Denver metro area, which represents more than half the state’s population of 5.3 million, has tripled in population over 50 years, from less than 1 million to 2.7 million in 2010, and it has continued to grow since the last decimal census. The City and County of Denver, which struggled with a host of issues in the 1970s and 1980s, returned to regular population increases in the 1990s. But the city, which represented half the region’s population in 1960, is now at 21 percent and continues to decline relative to the suburban and exurban growth. VP – Hick or Mike? Speculating on the Vice President selection has a picking the final four quality – one is often surprised. Cheney and Palin were recent unexpected Republican picks. But Democrats with Ferraro and Gore more than two decades ago surprised the pundits. Some argue that the presidential election is all about the presidential choice and the VP is primarily a personal preference of the president. And, it is hard to see a VP making a difference in recent elections. People cite Lyndon B. Johnson for Jack Kennedy, but that was a half-century ago. Nevertheless, each cycle starts with speculation that the presidential nominee wants to address some perceived weakness and/or balance the ticket to attract some particular states’ voters. Since the Democrats already have a presumptive nominee, the only realistic speculation is for vice president and flights of names are in circulation. Colorado’s Democratic governor and senior senator are both on lists. Michael Bennet, approaching his first re-election in 2016 (the 2010 squeaker was an election confirming his appointment), entered the rumor mill as a perceived gender, age and geographic balance to Hillary Clinton. Bennet immediately said he wasn’t interested. Governor Hickenlooper has been denying interest since 2010 and his first election. The tough re-election dampened some speculation, but he still has his boosters. Both candidates have similar profiles. Hickenlooper benefits from not being in Washington and more state-level management experience. But Bennet is younger and one of national politics’ master networkers. Both are moderate in their ideology. It may be a longshot, but it is prestigious in political circles to be mentioned. Jeremy Meyer argues Denver would be best served if Mayor Michael Hancock had serious competition to spur a debate on the issues. It does not appear likely to happen. Two December 2014 blog posts point out how unlikely a Denver mayor loses an election: Denver Mayor Unopposed? (Dec. 16, 2014) and Denver Holds Election and No One Shows Up (Dec. 11, 2014).